Managing relationships with your clients and sales prospects is a challenge within itself. The moment you lose sight of goals for satisfying your client’s needs, you begin to lose sight of your company’s overall objective. CRM for the most part involves goals for acquiring new customers by attracting and winning them over, retain existing clients, winning back former clients and reducing marketing and customer service costs. With technology, performing these tasks becomes easier and more streamlined. In the past, a suite of software and hardware tools were need to manage your company’s customer relationships. However, “cloud computing” has now taken over as the go-to format for this task. By utilizing web-based software through companies that offer these services, your company benefits from not having to pay initial startup costs for a CRM system. Unfortunately CRM software is not just something you buy, install it and then sit back to watch your company improve overnight. While software can surely help you meet that goal, it requires hard work and most of all, dedication from a team of valuable employees. Collecting information from your clients is only worth your time and money if it’s used correctly. Before you set out in this venture, your company needs to decide what data it needs to pull and how it is to be used. As an example, if you were a clothing company, you would want to study your customer’s spending habits at particular times of the year. Since the clothing industry revolves around styles, seasons and trends, this information is extremely valuable to ensure that you’re offering the best products to your customers, but more importantly, at the right time! If you ever wondered why stores ask you for your birth date, your phone number, zip code, etc. it’s because they’re “mining” you for bits of information that can help them sell to you better. Even store security cameras that were once only used to catch thieves are now being used to watch how people navigate stores and find things (or not). All of this data is helpful to everyone involved in the company from the product buyer to the person that stocks the shelves. In the online world, things are a bit different, but the rules generally apply. How you design your website such as page layout, colors, links and more will ultimately define how your customers interact with it. You can use tools such as Google Analytics to find out more about where people are clicking on your site, where they came from, how long they stayed on your pages and the list goes on. As an example, if you sold a product that for some reason was selling much better to people in Finland than the United States, you might want to consider creating a second version of your site in the Finnish language. You will drastically improve your sales to those customers in Finland who could not read your English page. The costs associated with setting up a CRM solution can vary greatly depending on your desired results. CRM is a service and much like advertising, it doesn’t come with a sticker price. You can spend as little or as much as you wish, but also like advertising, you get what you pay for. Large companies can expect to have a CRM budget of around $500,000 while very large companies have been known to spend over $10 million! Small businesses and/or small website operations can of course forgo having CRM teams and multi-thousand dollar budgets by simply opting to introduce some basic CRM software in their tool set. Even software such as Microsoft Office Outlook with Business Contact Manager can perform basic customer relationship management tasks. When you’re a small business, the goal is to maintain a relationship with your clients. You do this by sending out newsletters, monthly updates, special offers, birthday cards, etc. As an example with my site, I have RSS feeds that users can bookmark so every time I post content or make updates, they get the information without having to come back to my site to look for it. I also offer a monthly newsletter to anyone who signs up at my site. This newsletter is really a way to condense monthly updates while offering new information and promotional items that aren’t on my site. Customer surveys are a great way to interact with clients. You can offer people discounts the next time they shop with you if they are willing to answer some basic questions. This way, you not only get the information you’re after, but you may also gain a lifetime customer! As mentioned above, cloud computing has really taken off lately. Cloud computing is basically a set of online tools that would normally be spanned across 3-5 software programs installed on your computer. For example, instead of using Outlook for your email, you use webmail from your company domain. 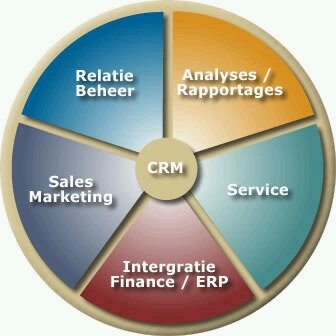 For CRM, there are a plethora of online services that offer tool to manage your customer base. One of the larger ones is SalesForce.com. They offer services starting at just $5 per month. The advantage of online CRM solutions, besides the fact that you don’t have to buy and rely on software, is the ability to grow your needs only when your business grows. You don’t have to buy one $5,000 package for the 5 clients that you have. You can start out small and add tools as needed. These sites have much more information on this topic and they’re worth a look if you’d like to move forward with a CRM plan. Thanks for your post, Brandon. You brought up a lot of good points. Thought I'd chime in with some resource links from Microsoft. They're trying to tailor help to the small business community and I’ve included a couple of links below that might be worth checking out. Thanks! Those links are valuable resources.